“Jidhr” means root. 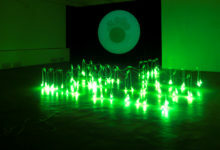 This installation is comprised of seventy-seven green lights hung according to the motif of a very stylized and geometric tree leaf made up of seven branches (eleven lights per branch). The top of the leaf is oriented towards Mecca. The entire work is hung with transparent fishing wire and the lights are upside-down such that they almost touch the concrete ground on which they reflect.